I had the most delightful opportunity to interview the awesome Hansi Oppenheimer, director and producer of the film about females in fandoms: Squee! Squee! is for fangirls everywhere. What the documentary will do is attempt to debunk common misconceptions of fangirls, and exploring the true meaning of what it truly means to be a fangirl. The film uses interviews, weaving them into a narrative, and it is ALL about community. My interview with Hansi follows. BR: What made you want to make the documentary, initially? HO: I’m a huge fangirl. My last film, Color Me Obsessed, was about my favorite band, The Replacements. Since I didn’t have access to the band, I started talking with the fans and overs the years I spent making that film, I realized how much I love fan culture. So, when I started this film in 2012 it was originally going to be about fanfic but I struggled with that for two years and it didn’t really work. Then last June, I began thinking about focusing on fangirls and then it just seemed to just come together really quickly. The things that interest me about fandom; like community, friendships, and creativity, could be explored through the interviews with all kinds of fangirls. I also wanted to “reclaim” the term “fangirls,” and make it as cool and powerful as the women I was speaking with. So Squee! Is really a celebration of smart creative women and their vibrant community. BR: I understand Squee! is a sound some think fangirls make. At least that is how pop culture sees it. Why did you choose Squee! as your title? Was it for that reason? Or something different entirely? HO: Yes, it’s the sound of joy and excitement and that’s one of the things I most love about fandom and fangirls in particular. Fandom is one place you can be your authentic self, you can express your feelings – whatever they are – and show your passions. I think that being able to express yourself, without censorship, is one of the best things about the fandom community. I’m not saying other fans won’t disagree with you, sometimes quite vehemently, but there are a lot of platforms for creative expression in fandom: everything from blogging to cosplay. For the most part, the community is very loving and supportive of each other. 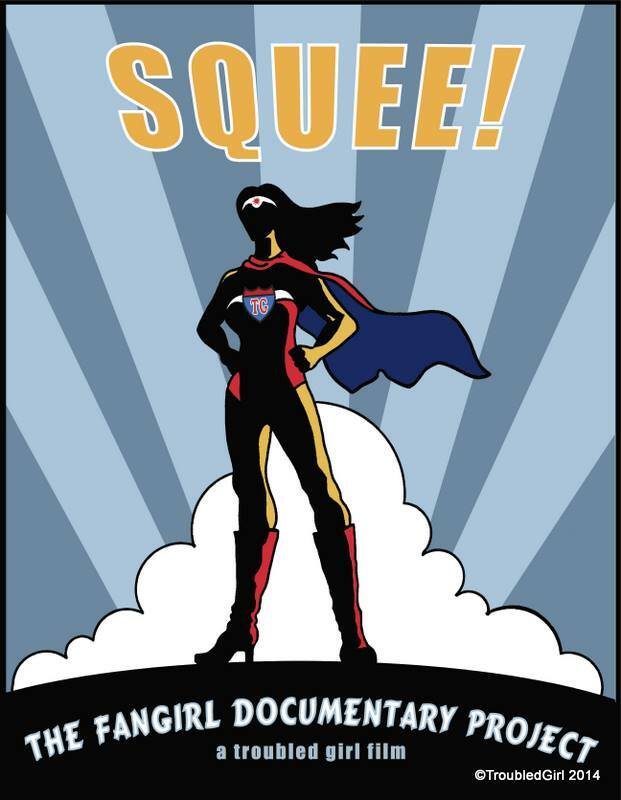 So I am calling the film Squee because it’s all about expressing joy. BR: Okay, thank you for explaining that. What got you started in geek culture, and how involved would you say you are within it? I attended Horror Cons, but Ascendio 2012 (a Harry Potter Fancon) was my first non-horror con and I had a wonderful time. They had invited me to shoot interviews with them for the fanfic project. They were such a lovely fandom…Anyway, since then, I go to every con I can. I’m pretty involved, I think. I attend NYCC, D*Con, Wizard World, Ponycon, RICC, Philly, Comikaze, Supernatural Cons…I have a Tumblr (The Fan Vault) and regularly post about my fandoms (Supernatural, Sherlock, Doctor Who, Torchwood, American Horror Story, The Walking Dead, Bob’s Burgers, The Tick, Buffy the Vampire Slayer, and Invader Zim). I do photo ops and autographs and visit locations, play World of Warcraft, and participate in GISHWHES (a charity scavenger hunt/performance art/craziness invented by actor Misha Collins). BR: You’ve brought up community a few times. How important do you consider community in fandoms to be? BR: About Squee!, were there any issues during filming that you had? Such as uncooperative people, misrepresentation of fandoms, or anyone giving you trouble? HO: Honestly, I have had nothing but wonderful experiences making this film. I’ve gotten to meet and speak with some amazing, funny, smart women. I’ve made friends with many of them. I had the opportunity to talk with them and share our geeky passions. It’s been great! BR: Do you have any role models? People who inspire you? HO: I’ve been able to interview some of the geeky women I admire for this film. Like Heidi MacDonald, Lynn Zubernis, Amber Benson, Cecilia Tan, Kathleen O’Shea David, Naomi Novik, Cricket Lee…I’d still love to talk with Clare Kramer, Clare Grant, Felicia Day, Kim Rhodes, and Aisha Tyler. BR: Do you have any favorite superheroes or comic book characters? HO: Absolutely! I adore Jonah Hex (the ones written by Joe R. Lansdale), I love Preacher by Steve Dillon and Garth Ennis, especially The Saint of Killers and Tulip, and I love Hellblazer and am really enjoying the show Constantine. And of course Spider Jerusalem from Transmetropolitan. And Buffy is my favorite superhero. BR: Well awesome! Is there anything final you’d like to add that you think the readers of TGI should know? HO: I’m still shooting interviews in the Northeast for a few more months. My film, Color Me Obsessed, is available on Hulu. Also, please like the Squee! Facebook page! Squee! comes out this November!